Multilevel marketing • Says founder of watchdog website, "It is an enormous flimflam on an almost incalculable scale." Robert FitzPatrick, founder of the website PyramidSchemeAlert.org. Lured by the promise of wealth, thousands of Utahns every year become "distributors" of the pills, potions and lotions multilevel marketing companies in the state make. Nearly all will fail, with their money flowing into the pockets of an elite few top-level distributors  men and women who typically get into the game early and make a fortune off those who try but fail to duplicate their successes. "You hear of people making a fortune in multilevel marketing. You also hear of people who made a fortune playing the lottery. Neither one is a good way to try to make a living," said Jon Taylor of Kaysville, an industry critic and author of The Network Marketing Game. Multilevel marketing companies, also known as network marketing companies, operate pyramid-like sales structures made up of multiple levels of independent distributors who earn commissions by selling products. The problem is, the products usually are expensive  $30 or more wholesale for less than a quart of fruit juice, for example. Marking them up even more for sale to the public doesn't produce a lot of retail sales. Instead, the distributors are the customers. They rely on getting a piece of the sales from new distributors they recruit  and on down the line. For the thousands at the bottom, though, it is nearly impossible to break even. But for those near the top, usually just a handful to several dozen people at each company, the money rolls in. The top seven MonaVie distributors earn an average of $3.4 million a year. The top three distributors at XanGo earn an average of $1.3 million a year. Top-of-the-pyramid distributors at Usana earn an average of $857,865 annually, while Nu Skin's top 115 or so "Blue Diamond" executives in the U.S. earn $535,276 a year on average. Would-be entrepreneurs often can't resist the lure of that kind of money. No matter how elusive the promise, they see an opportunity to work their way up to the elite earning level achieved by people such as Justin Prince. Dressed in a neatly tailored suit and standing in front of a white board at XanGo's headquarters last month in Lehi, Prince, a "premier" distributor, explained to a small group of new and potential distributors how they, too, could duplicate his success. Premier XanGo distributors  who in terms of earnings are among the top one-quarter of 1 percent of the company's sales force  make an average of $10,000 a month, although Prince said he makes more. "You'll want to use at least $200 of XanGo products a month, and in your first month connect three people, who also will buy $200 worth of product," Prince said, writing those figures on the board. "At the end of your first month, you'll make $180." The next month, he said, do the same thing while helping the three people initially connected bring in three more people each. "Your second month you'll make $480. At that point you're cash-flow positive." Do it for a third month. "At that point you have built a $9,480 a year business," Prince said, explaining by duplicating that effort for another three months someone can make $14,000 a month, or $168,000 a year. But Prince, who joined XanGo three years ago, also tempered his remarks. "Let's say for the sake of argument this is way optimistic," he said, gesturing toward the board. "Let's say it is 75 percent unrealistic and three out of four people don't do what they say they're going to do. At the end of six months, you'll still be making $40,000 a year." 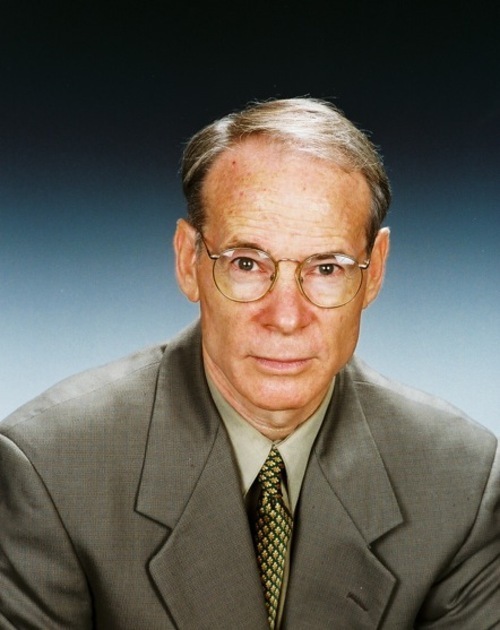 Such talk reveals an underlying truth about multilevel marketing companies, said Robert FitzPatrick, founder of the website, PyramidSchemeAlert.org. "They are just product-based pyramid schemes built upon an endless chain of recruitment." To support his argument, he pointed to the turnover rate of distributors. The Direct Selling Association, the Washington, D.C.-based trade group that represents many of the nation's network marketing concerns, estimates the annual turnover among distributors is 56 percent. So statistically, at least, there's a whole new corps of distributors every two years. Rather than interpreting that as evidence companies are churning low-level distributors in order to keep the money flowing to top-level earners, the DSA offers a different explanation. "People get involved in direct selling for many reasons," said Amy Robinson, the DSA's chief marketing officer. "Very often it is to fulfill a short-term goal, say buying a new refrigerator. They'll get involved for a few months, reach their goal and drop out." Yet information from Utah's top companies suggests even such a modest goal will be difficult for most to achieve. Of MonaVie's active distributors, 85 percent earned commission checks in 2009 averaging $35 a week or less. Of Nu Skin's 76,246 distributors in the U.S. in 2009, 11,360 earned a commission check, and for a little more than half that number the average was $65 a month. Distributors on XanGo's two lowest earning levels, or nearly 73 percent of its active distributors, bring in an average of $122 a month or less. Usana reported that of its 165,710 associates, including those just starting out, the average yearly income was $617. What isn't disclosed are the often thousands of dollars in expenses distributors can incur trying to generate a commission, which might include time and the cost of purchasing promotional and sales-development materials from the companies or top distributors. "None of that comes without cost. These aren't just pyramids based upon products, they're also pyramids based upon time and effort," Taylor said. But Brian Douglas, a top level Usana "diamond director," believes those who are committed can build a successful multilevel sales organization, just as he did after joining up with the company 14 years ago. He offered his own explanation of why so few succeed. "There is a high failure rate in any business," he said. "The big problem we have is there is a very low cost to get involved. It is easy in, easy out. With low cost of entry, it is easy if things aren't going great to throw up your hands and walk away. If you had a million bucks invested in a franchise, you would do everything you could." For FitzPatrick and Taylor, though, the deck is stacked against new distributors no matter how much time, effort and sincerity they bring to the table. "If you have a company with 100,000 distributors and half leave every year, that means over five years 250,000 people who would have come and gone," leaving their money behind, FitzPatrick said. He conceded that the lure of direct marketing for many can be irresistible, especially during tough economic times. "In one sense, network marketing companies do have a product that is in growing demand  the promise of a steady income. But at the end of the day, 99 percent of those involved lose money. It is an enormous flimflam on an almost incalculable scale." MonaVie • The top seven earn an average of $3.4 million a year. Nu Skin • The top 115 or so "Blue Diamond" executives in the U.S. earn $535,276 a year on average. Xango • The top three distributors earn an average of $1.3 million a year. Usana • Top-of-the-pyramid distributors at earn an average of $857,865 annually. Monavie • Of active distributors, 85 percent received commission checks in 2009 averaging $35 a week or less. 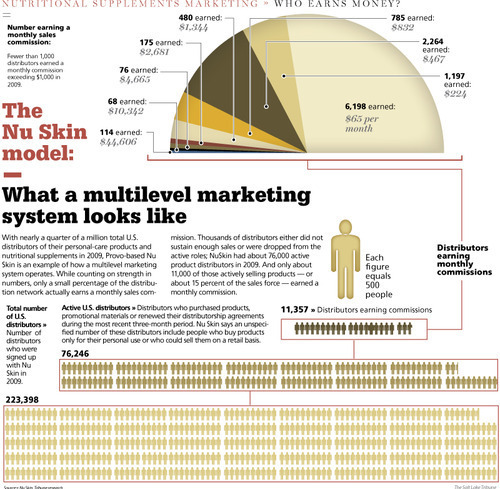 Nu Skin • Of 76,246 distributors in the U.S. in 2009, 11,360 people, or fewer than 15 percent, received a commission check, and for a little more than half that number, the average was $65 a month. XanGo • Distributors on the two lowest earning levels, or nearly 73 percent of active distributors, bring in an average of $122 a month or less. Usana • Of its 165,710 associates, the average yearly income was $617. Nu Skin• The top 115 or so "Blue Diamond" executives in the U.S. earn $535,276 a year on average. Usana • Top-of-the-pyramid distributors earn an average of $857,865 annually. Nu Skin • Of 76,246 distributors in the U.S. in 2009, 11,357 people, or fewer than 15 percent, received a commission check, and for a little more than half that number, the average was $65 a month. Source • Company disclosure statements.